Asian teams are usually impregnable at home in Tests. Even the 3 most accomplished non-Asian teams – Australia, South Africa and England – struggle to win Test series in India, Sri Lanka, Pakistan and Pakistan’s adopted home in the UAE. Since the dawn of the new millennium, Australia, South Africa and England have toured the India, Sri Lanka, Pakistan and the UAE a combined 37 times but have registered Test series wins on just 10 occasions. In spite of all this, South Africa will be favorites when they tour Sri Lanka for a 2 Test series. The Proteas have emphatically beaten both India and Australia at home while Sri Lanka are a team in disarray with many players missing due to injury. Here are 5 things Sri Lanka need to do to emerge victorious in the 2 Test series. Every team is expected to have bench strength as cover in case their top players are missing due to injury or poor form. However, Sri Lanka have been besieged by a lot of injuries, which have made their dressing room look like a hospital ward. In the pace department, Nuwan Pradeep and Dusmantha Chameera are down with injuries while Angelo Mathews seems to spend more team on the sidelines than on the field. Both Rangana Herath and Kusal Perera are included in the squad for the South African series subject to fitness. In the current Lankan set-up, they just don’t have the players to step up in the absence of these injured players. There is also doubt over Chandimal’s participation as he may face a further ban from the ICC for bringing the game into disrepute against the West Indies. South Africa have probably the best pace attack in the world and will definitely triumph if the Lankan’s prepare green tops or bouncy wickets. 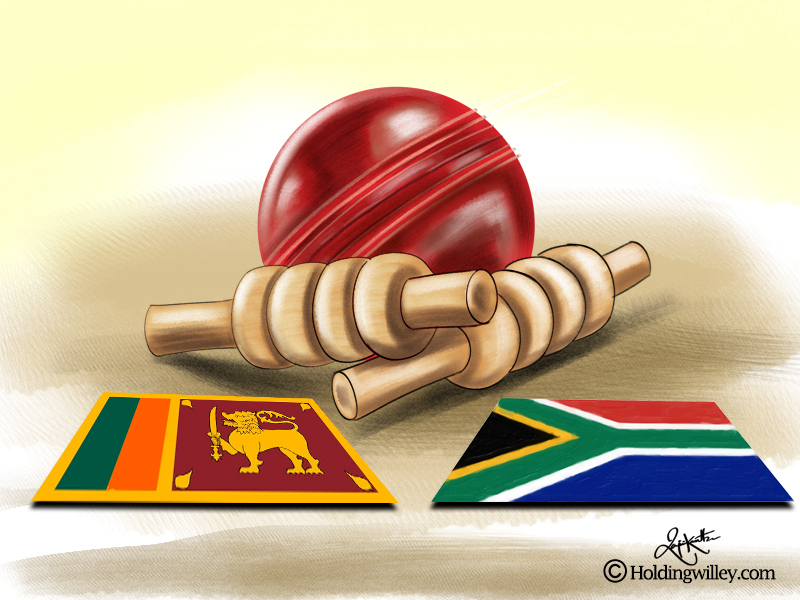 Sri Lanka have to produce turning tracks and hope that Herath bowls at his best to have any hope against the Proteas. Since July 2016, Sri Lanka have played in 4 Test series at home and have won 2, lost 1, and drawn 1. In the two series where the Lankans came out the victors, Herath took 28 wickets in 3 Tests against Australia at a paltry average of 12.75, and 11 wickets in a solitary Test against Zimbabwe at 22.63. However, in the 3 Test series against India, in which they were routed 3-0, Herath took just 5 wickets at an exorbitant average of 69.4. It is no exaggeration to say that Herath holds the key to Sri Lanka’s fortunes and he needs to be at his best against the visitors. That is easier said than done as he is 40 and always seems to be on the brink of retirement. Since 1st July 2016, Sri Lanka has played 24 Tests and batted in 47 innings. In those 47 innings, their openers have registered just 1 century partnership and 7 fifty run partnerships. The 1 century partnership was against Zimbabwe at Harare in October 2016. In 40 innings since then, the openers have shockingly failed to put together even a single 100 run stand. The South African pace attack will be relentless. Failure to provide good starts at the top of the order will be a recipe for disaster. Keshav Maharaj has proven his caliber in Tests but has yet to play a Test in the sub-continent. If Sri Lanka’s openers can see off the new ball and prevent South Africa’s pace attack from making early inroads, then it makes Maharaj’s task more difficult, and the Lankans can capitalize on his inexperience in Asian conditions. Ever since AB de Villiers announced his retirement, South Africa have had an AB shaped hole in their batting order. In the 7 Tests that the Proteas played at home against India and Australia since January 2018, AB scored 638 runs at an average of 53.16. Experienced players like Hashim Amla, Faf Du Plessis and Quinton De Kock averaged just 28.5, 27.53 and 23.61 respectively from the same number of Tests. If Sri Lanka want to win the series, they need to capitalize on the poor form of these 3 batsmen, as that will put enormous pressure on openers Aiden Markram and Dean Elgar. While every team have a few marquee players upon whom they rely, Sri Lanka depend too much on Chandimal to score the bulk of their runs, especially with Mathews missing in action. They should go for broke and ask Chandimal to bat at the number 4 position as he is more likely to influence his team’s fortunes batting higher up, rather than batting lower down to repair the damage. Since July 2016, Chandimal has scored 1,635 runs at 45.41. Kusal Mendis was inexplicably dropped for the tour of India but the promotion to the opener’s slot seems to have done him a world of good, even though he has batted for only 5 innings at the top. Sri Lanka cannot expect the tail to wag much against this strong Proteas bowling attack and all their batsmen need to chip in if they are to have any chance of winning the series.